Area - 154 Square Miles. Whether it’s a neighborhood with tree-lined streets that you’re seeking or the security that comes from knowing you’re in one of the nation’s safest cities, you’ll find it in Aurora. The city was founded on a sense of community and that tradition continues today. Aurora’s government cares about its communities and provides many services to the people who live here. Here you will find neighborhood grant programs, home ownership assistance, neighborhood libraries and your own community television station. And don’t forget safety. Aurora is home to one of the finest police and fire departments in the metro area. 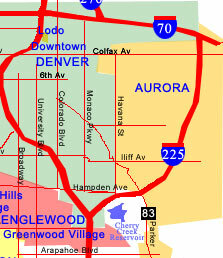 Closest city to Colorado's Denver International Airport, which is about a 15-minute drive from the center of Aurora. Two reservoirs in city limits (Aurora and Quincy) and one in unincorporated Arapahoe County with an Aurora mailing address (Cherry Creek) providing boating, sailing, fishing, swimming, bicycling and picnicking opportunities. 97 parks and 6 public golf courses maintained by the Parks, Recreation & Open Space Department. More than 8,000 recreation programs offered annually by the Parks, Recreation & Open Space Department. Less than a one-hour drive to the Rocky Mountains. Source: U.S. Department of Commerce, National Oceanic and Atmospheric Administration, Climatogrophy of the United States, No. 81; and Comparative Climate Data.